This beautiful Spatchcock Chicken is crispy, juicy, and bursting with flavor! Super easy to prepare and done in less time than roasting it whole! Did you know that if you spatchcock a chicken you’re cutting down the cooking time by half? Yes, half! 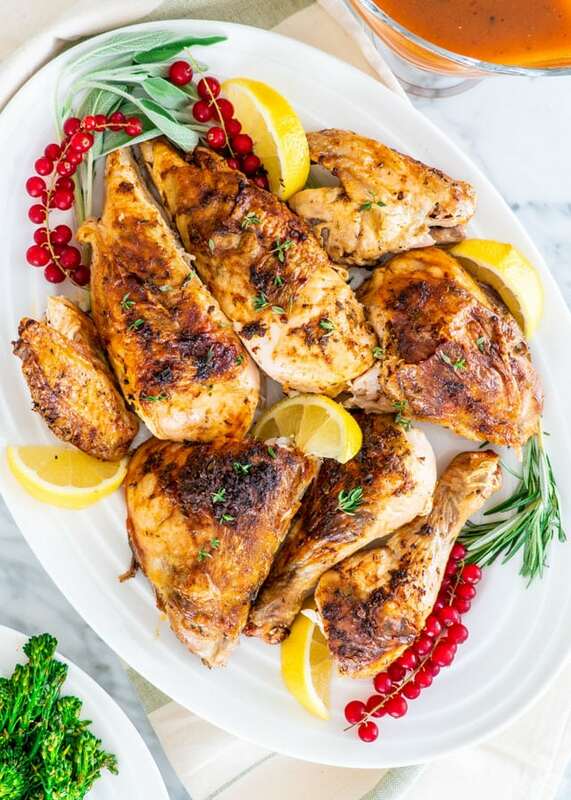 To me that’s a big plus, especially in the summer because the last thing I want is to have the oven on all day, but I still want my home cooked meals, which is why this spatchcock chicken is perfect. To spatchcock a chicken basically means to butterfly the chicken and remove the backbone. While this looks complicated, it’s super easy to do. Not only that, but in about an hour you’ll have a very impressive dinner, fool proof, insanely delicious for your entire family or friends. You can use this method for Cornish hens as well or quails, and cook them in no time at all. While removing the backbone may look scary or hard, it’s really easy to do and all you need is a good pair of kitchen shears. Because this spatchcock chicken requires less time in the oven, you end up with a super juicy bird. Even the breast won’t be dry, and nobody likes a dry breast. Butter – for the compound butter. Compound butter is a mixture of butter with spices and herbs. Poultry Herb Blend – You can find poultry herb blends in your local grocery store located with all the other herbs. Usually they contain rosemary, sage and thyme, so if you cannot the blend you could always buy them separately. I made a compound butter with poultry herbs, garlic and smoked paprika, which I spread half of it under the skin and the remaining over the skin for extra flavor and yumminess. Trust me, this butter is one of the secrets to this chicken being super juicy and succulent. 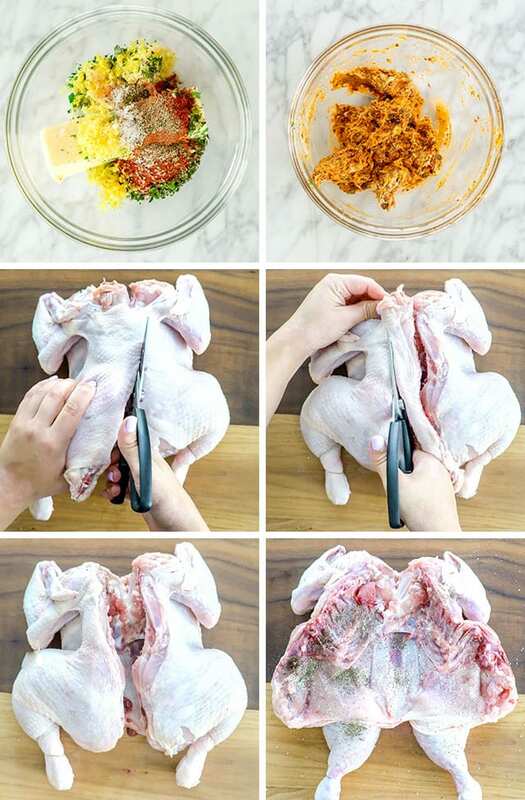 Make sure you first place the chicken breast-side down and the legs towards you. Use a good pair of kitchen shears to cut up along each side of the backbone, cutting through the rib bones as you go. Open the chicken out and turn it over then flatten the breastbone with the heel of your hand, by pressing down (see video) so that the meat is all one thickness. 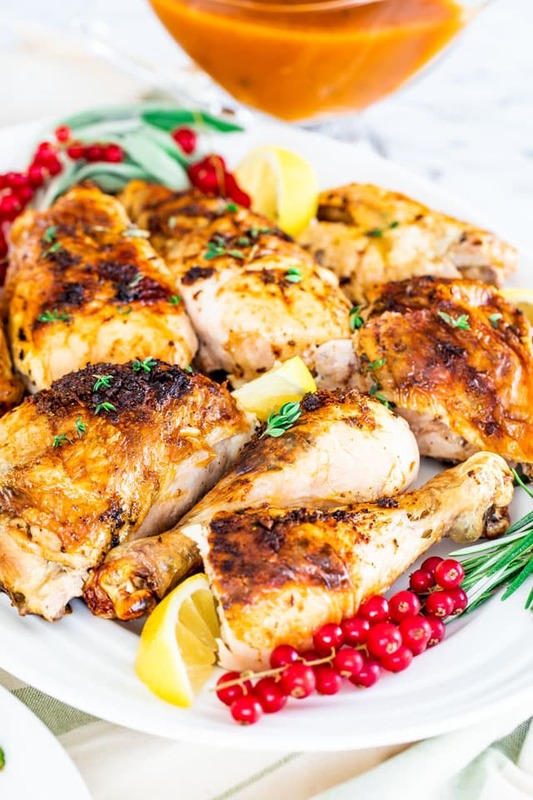 Season well on both sides with your favorite poultry seasoning and roast in the oven as stated in the recipe or barbecue on a grill for 15-20 minutes per side, depending on the size of the bird. If you’re lucky enough to have leftovers from this chicken, store them in an airtight container and refrigerate for up to 5 days or freeze for up to 3 months. You absolutely can! Make sure to let the chicken cool completely before you freeze it. 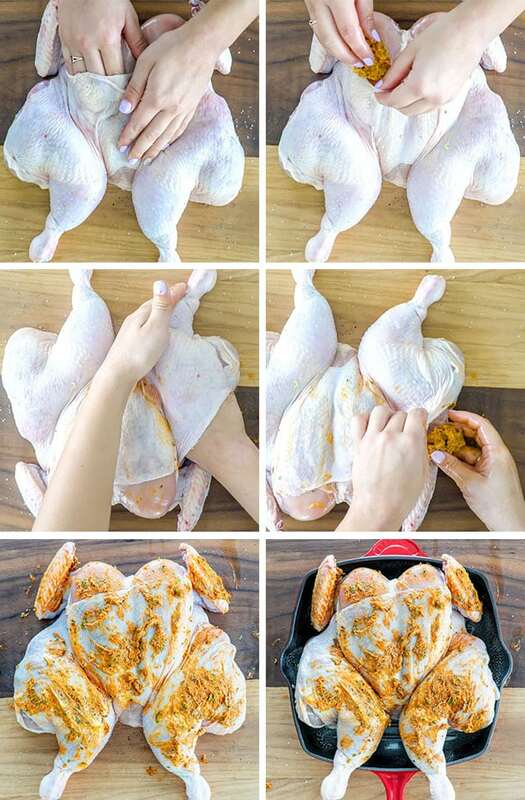 Place individual pieces of chicken into freezer bags. Remove as much air as possible from the freezer bag as you slide the zipper closed. Freeze for up to 3 months. Prepare oven and skillet: Preheat your oven to 425 F degrees. Spray a large skillet with cooking spray. See recipe notes if you don't have a large enough skillet. Make compound butter: In a small bowl add the butter, poultry herb blend, garlic, lemon zest, salt and pepper. Whisk or mash with a spatula until well combined. 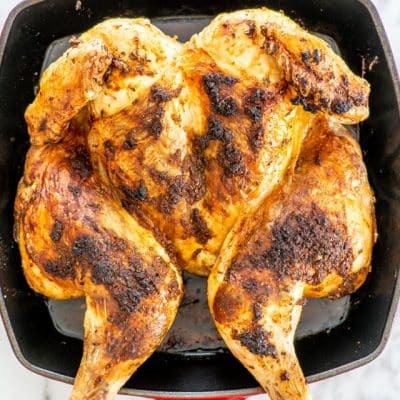 Spatchcock chicken: Place the chicken breast-side down and the legs towards you. Use a pair of kitchen shears to cut up along each side of the backbone, cutting through the rib bones as you go. Open the chicken out and turn it over then flatten the breastbone with the heel of your hand, by pressing down (see video) so that the meat is all one thickness. Cut the wing tips off as well. Season chicken: Season the inside of the chicken generously with salt and pepper, then flip it over so that the breast side is up. Apply compound butter: Run your fingers under the chicken skin (breasts and legs) and rub half of the compound butter under the skin. Spread the rest of the mixture over the top of the bird. 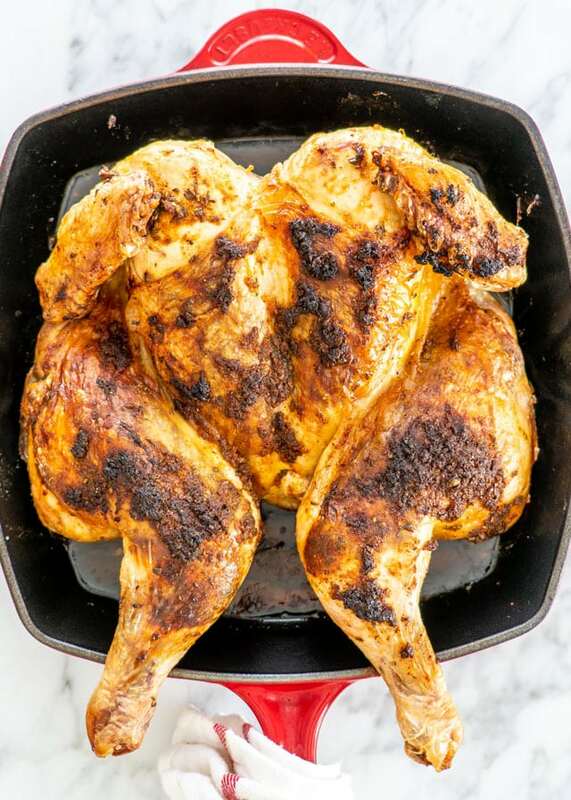 Bake: Place the chicken in the prepared skillet and bake uncovered for 45 minutes or until it registers 165 to 170 F on an instant-read thermometer. The time can vary if using a different size chicken. Let chicken rest: Let the chicken rest at room temperature for about 15 minutes before carving it and serving. Make gravy: To make the gravy cook the fat drippings from the skillet in a saucepan over medium heat until bubbling. Stir in the cornstarch and chicken broth or water. Stir constantly using a whisk, bring a boil and boil for 1 more minutes. Taste for seasoning and adjust with salt and pepper as needed. 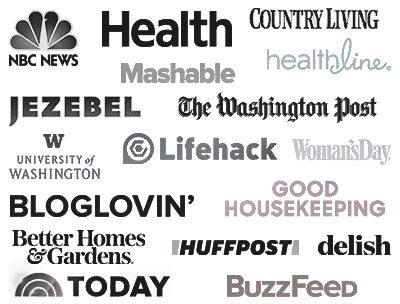 * You can find poultry herb blends in your local grocery store located with all the other herbs. Usually they contain rosemary, sage and thyme, so if you cannot the blend you could always buy them separately. If you don't have a skillet (about 12 inch) large enough to roast the chicken you can use a baking sheet. Line a baking sheet with aluminum foil, then place a baking rack over it. Spray the rack with cooking spray. If your oven has a Roast function, preheat it to 375 F degrees and roast it for 35 minutes or until it registers 165 to 170 F on an instant-read thermometer. The time can vary if using a different size chicken. The nutritional information is for 6 people. Please keep in mind that nutritional information is a rough estimate and can vary greatly based on products used. Once again Jo you nailed it! Great flavor, simple to prepare, moist and tender! Love it! Thank you! Your cooking notes suggesting roasting at 375; however, the recipe states setting the oven temp at 425. Can you explain? Thank you! 375 is only if your oven has a Roast function which is different than a bake function. Usually with convection roast function food quick 30% faster. Hope this helps. This was absolutely delicious!! I have an extremely picky husband and he loves it! This is by far the best roasted chicken recipe I have made. My husband who hates chicken enjoyed this meal. Thank you for sharing. This is my go-to for roasting entire chickens! We’re so glad you love the recipe. Great Recipe. 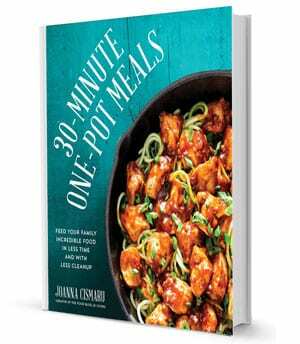 Super fast and easy for a Tuesday dinner. 10 minutes to pull together and an hour later a semi fancy dinner. Thank you for teaching us how to do this! I buy them at Costco and Trader Joe’s already spatchcocked, but I had no idea how to do it myself! This is such a great method and I just love this seasoning combo. Delicious! This is a recipe everyone on earth needs, truly classic. I had no idea!! These photos and information are just so helpful. Most recipes usually grill it, but I love that you shared a roasted version. Looks so SO good. It is delicious, hope you try it! Such a perfect chicken. Simple, flavorful, and cooks up quickly! Hi Jo ,I have just bought a Sunbeam 5 in 1 pressure and I have made your chicken soup first off , do you have anymore recipes for your Instant Pot, I would love some if you have a collection. I have a whole chicken in the freezer and I’ve been stumped trying to decide what to do with it as I didn’t feel like simply roasting. Perfect timing on sending out this recipe! This sounds delicious and I will report back how it works out for me! Sounds great, hope you like it! Follow up: made this for our Sunday dinner and it was delicious! My husband’s new favorite way to have roast chicken. Thanks for a great recipe! I tagged a photo on IG so you could see how it turned out.